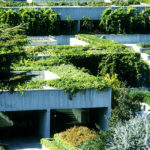 The November 1989 issue of Irish America featured an interview with Kevin Roche, the Irish-born architect famous for shaping the American landscape with his stunningly innovative buildings – corporate, educational and residential – in areas both urban and suburban. 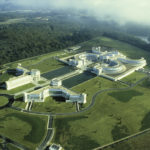 It was seven years after he had won the Pritzker Prize, the highest honor in his field, and with a career spanning over 30 years there were many key projects to reflect on, including the Ford Foundation building in New York, the skyscrapers of the U.N. Plaza, California’s Oakland Museum and the geometric Union Carbide Corporation headquarters in Danbury, CT. 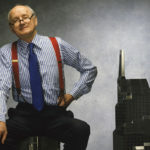 But, as the article’s lead indicated, Roche was also looking to the future: “In the past 30 years, Kevin Roche has established himself as one of the finest modern architects of his generation. At age 67, he had no thoughts of retirement.” “Architects never retire,” Roche confirmed. 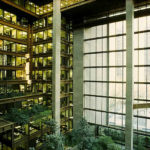 Recently speaking over the phone from the Connecticut headquarters of Kevin Roche, John Dinkeloo and Associates, Roche laughed when reminded of this. “That was a long time ago,” he said. 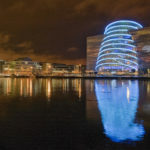 In the 22 years since then he has worked prolifically, completing impressive original projects such as the Conference Center on the banks of Dublin’s Liffey, the massive Santander Headquarters in Spain and the soaring glass Shiodome in Tokyo’s city center. 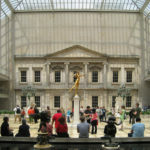 He has also worked on important renovations, most notably his ongoing work with the Metropolitan Museum of Art in New York. Roche is now 90 years of age, and one gets the sense that retirement is still far from his thoughts. There is more work to be done on the Met’s Costume Institute, and designs are under way for a new Dreyfus building in Washington, D.C.
After he was released, the elder Roche moved the family to Mitchelstown, Cork, where he went on to become general manager of Mitchelstown Creamery, one of Ireland’s largest dairy and farm co-operatives. Roche attended Rockwell College in Co. Tipperary, where, he said, he wasn’t a particularly good student. “There were the honor students and then there were the middle students and then there were the barely best students and I fell into the barely best,” he chuckled. His studies at the IIT were cut short when his funds ran dry, as transferring money proved difficult in the post-war environment. 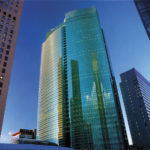 After traveling to the West Coast, Roche wound up in New York, where he sought work at the massive United Nations building site. They didn’t have any openings for architects, so he worked as an office boy. Roche hadn’t really planned on staying in America long-term, but an opportunity presented itself. He heard that the famous Eero Saarinen, son of Finnish architect Eliel Saarinen, was looking for apprentices. 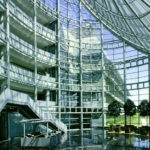 Jumping at the chance, Roche moved to Bloomfield Hills, MI, and began working with Saarinen on the General Motors Technical Center in nearby Warren. 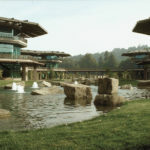 As Roche explained in his ’89 interview with Irish America, his work with Saarinen would be pivotal to the course of his career and to his own architectural philosophy which, inspired by Saarinen’s approach, became more humanist. 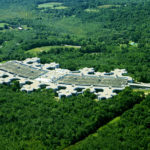 After becoming the firm’s senior design associate in 1954, he worked closely with Saarinen on such projects as the St. Louis Arch, Washington, D.C.’s Dulles International Airport and the CBS headquarters in New York. Many of those projects were still under way in 1961 when Saarinen died suddenly, a week after a cancerous growth was discovered in his brain. 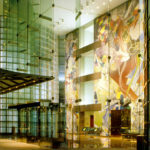 Roche and John Dinkeloo, the head of production, were named the new partners of the firm, which was in the process of relocating to the East Coast at the time. 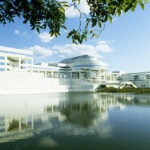 They carried on, finishing Saarinen’s remaining projects before landing their first major commission as a team, the Oakland Museum in California. 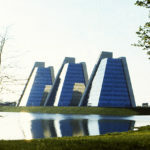 They started their own firm, Kevin Roche, John Dinkeloo and Associates in 1966. 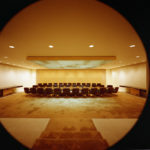 They worked fruitfully together on many prominent commissions that included the Ford Foundation headquarters in New York and the National Aquarium D.C., until Dinkeloo’s death in 1981. 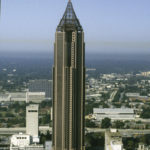 Since then, Roche has been the visionary behind such buildings as the Nations Bank Plaza – the tallest building in Atlanta – the Museum of Jewish Heritage in downtown Manhattan and its moving Holocaust Memorial, and New York University’s Kimmel Center for University Life. When told that I had recently been inside that very building, he asked “And were there students sitting on the steps?” There had been. “Well that’s what we wanted them to do. It’s funny how people actually love to sit on them. We got that at the Met too, people love to sit on those steps,” he said, referring to what are some of the most sat upon steps in all of New York City. His interest in that seemingly minute detail of how his design is being enjoyed, long after his part is essentially over, sums up one of the most interesting things about Roche’s work – the heightened awareness he has, whether he is designing a corporate complex or renovating a museum wing, for the way people move throughout a space, how they react to and interact with it. His buildings are modern and innovative, but his vision for them is inspired by the idea of community. Roche and his wife of 49 years, Jane (née Touhy) with whom he has five children and thirteen grandchildren, live in Connecticut, “in an old house surrounded by trees.” They spend many weekends in New York City, where the have “a little apartment and try to catch up on everything that’s going on.” In the same way that he is adept at working in environments both natural and urban, Roche enjoys moving between the two. “Each one has its own virtues and its own advantages and I think that being able to move from one to the other is the ideal situation,” he said. We’ve had quite a year (at Irish America we measure time from March to March). In March 2011 we hosted our inaugural Hall of Fame luncheon in New York City, and later that year opened our Irish America Hall of Fame in New Ross, Co. Wexford. It was a defining moment for the magazine – a bringing back home the story of the American Irish – who they are, and what they had achieved. And the story continues in this issue with the profiles of our 2012 inductees, including architect Kevin Roche who graces our cover. This issue is also chock full of Irish culture, heritage, music, and an added touch of glamour from a cast of Hollywood personalities, including Anjelica Huston whom I was especially pleased to interview because Irish America’s links to the Huston family go way back. It was around this time of year in 1987 when a phone call from John Huston gave the Irish America team a much needed boost. Money was tight. The economy was in the doldrums with 19 percent unemployment back home and Black Monday, the second worst stockmarket crash in history, looming in the U.S. In short, it was a miserable time, and friends and family and advisors told us we were crazy to think that we could keep the magazine afloat. But John Huston was making the James Joyce short story “The Dead” into a movie and we somehow found the resources to send writer Tom English to visit the set in Los Angeles. On the appointed day, I hovered near the phone wanting to be the one to pick up. I’ll never forget Huston’s voice on the other end of the line. The great old director was on oxygen all the time back then, but his voice sounded strong and deep as we chatted. I was struck by the fact that he didn’t have an assistant put him through but had picked up the phone and called himself. It really meant something that someone of Huston’s stature believed in us. It was the boost we needed, that I personally needed, to keep going. Last year, when the Huston children donated their father’s papers to the University of Galway, that issue of Irish America with his image on the cover was part of the archive. Huston, who died a couple of months after his interview ran in the magazine, had a love affair with Ireland that lasted 20 years. His final lovelettter was The Dead, his last movie, which he made with the help of his children – his son Tony who wrote the screenplay and his daughter Anjelica who played Gretta Conroy and brought such sweet sadness to the role. It’s an exquisite piece of work, and a great gift to the Irish nation. This year, we wanted to do something special to honor people like Huston and others who have done so much for Ireland, and so on July 4 the inaugural Irish America Day will take place in New Ross, Co. Wexford, and we will induct John Huston and several other great Irish Americans who have passed on into our Irish America Hall of Fame. Come and join the festivities. We promise that it will be a great celebration of the ties that bind our two countries. Loretta Brennan Glucksman, co-chair of New York University’s Glucksman Ireland House, chairman of the American Ireland Fund and a strong advocate for Ireland, is inducted into the Irish America Hall of Fame. A third-generation Irish American and chairman of the American Ireland Fund, Loretta Brennan Glucksman has worked tirelessly to promote Irish culture and to establish strong ties between America and the island of Ireland. She was raised in an Irish neighborhood in Allentown, PA, the granddaughter of four Irish immigrants. Her maternal grandfather was a miner from Leitrim, who emigrated and settled in Coaldale, PA and was involved with the first unionizing efforts there. Her father worked on the railroad during World War II before joining the Civil Service, first as a mail carrier and then as an office worker. In the midst of this transition, Brennan received a unique opportunity to teach at Trenton State College (now The College of New Jersey). The position offered her a chance to teach while enrolling her children in the school’s early childhood program. Loretta’s career changed in the early 1970s, when New Jersey introduced a new Trenton-based public television station and she was asked to do a book program. She enjoyed the work, and eventually was asked to do a public affairs program, The Thursday Report, which she worked on for over a decade. After television she moved into public relations, first for New Jersey’s Environmental Protection Agency and then for the School Boards Administration. It was in 1984, while working at the latter, that she met Lewis Glucksman, then head of the investment bank Lehman Brothers, through a friend. 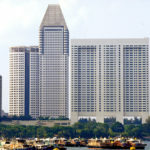 They had dinner at the Four Seasons, met again the following night, and were together from then on. It was through Lew that she renewed her interest in her Irish heritage. Though she always celebrated St. Patrick’s Day and had known her share of Irish phrases as a child, she had never been to the home of her ancestors. Lew had first visited Ireland when he was in the Navy during World War II and returned as often as possible, out of a love for Irish writers. In 1987, he took Loretta to Ireland for her first visit, which left her “overwhelmed and mesmerized.” Eventually the Glucksmans bought a home in Ireland near Cobh. Sadly, Lew passed away there in 2006. Between 1987 and 2006, the Glucksmans made many unforgettable contributions to Ireland and to the Irish-American community. 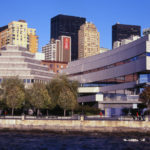 In 1993, Glucksman Ireland House opened at New York University. The idea for Ireland House came from Lew, who was an active trustee at NYU. Noticing that there were German, French and Latin houses, he made an offer to then-university president Jay Oliva to fund a center for Irish studies. 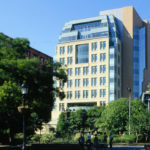 Nearly 19 years later, Ireland House offers both undergraduate and graduate classes, and is a leading center of Irish learning, arts and culture. Today, Brennan Glucksman is the co-chair on Ireland House’s advisory board. Following the opening of Ireland House, Brennan Glucksman was honored by the American Ireland Fund. The Glucksmans got involved with the organization as a result, and Brennan Glucksman became president. Her appointment took place right before the peace process, a time when the American Ireland Fund would play a key role in philanthropic efforts to spread peace throughout the island of Ireland. It funded two integrated schools for Catholic and Protestant children in the North, because, as Brennan Glucksman has stated, “it’s so crucial to break down barriers by educating children together.” In total, the Funds have raised over $250 million for Ireland and Irish causes. In addition to her work with the Fund, where she now holds the position of chairman, Brennan Glucksman serves on the boards of The National Gallery of Ireland, Trinity College Dublin, University College Cork and the Royal Irish Academy. Former Taoiseach Bertie Ahern also appointed her to the board of Ireland’s Industrial Development Agency. An ex-marine, former beat cop and the only person ever to serve two, non-consecutive terms as New York City Police Commissioner, Raymond W. Kelly has dedicated his life to serving his country and his city. Born on September 4, 1941 in New York City, Kelly is the youngest of the five children of James Francis Kelly and Elizabeth O’Brien, both first-generation Irish Americans. His father was a milkman and his mother worked as a coat check girl at Macy’s. Kelly grew up on 91st Street and Columbus Avenue before his family moved to Sunnyside, Queens. After graduating from Archbishop Malloy High School in 1959, Kelly went on to Manhattan College. During this time he was also a member of the inaugural class of the New York City Police Cadet Corps. He graduated from Manhattan in 1963 with a B.B.A. and joined the New York City Police Department. Shortly thereafter he accepted a commission to the United States Marine Corps Officer Program. He served on active military duty for three years including a combat tour in Vietnam. He returned to the Police Department in 1966 and entered the New York City Police Academy, graduating with the highest combined average for academics, physical achievement and marksmanship. Working under Police Commissioner Benjamin Ward in the 1980s, Commissioner Kelly was assigned to some of the city’s most troubled precincts and tasked with improving them. Based on his success in these and other challenging assignments, Kelly became a close advisor to Commissioner Ward, who gave him ever increasing responsibilities.. In 1990, Police Commissioner Lee Brown selected Kelly to serve as first deputy commissioner, his second in command. Upon Brown’s departure in October 1992, Mayor David Dinkins appointed Kelly to take his place. Kelly had served in 25 different commands before becoming Police Commissioner. One of the first tasks he undertook was the expansion of minority recruitment in the NYPD. He also reduced felony crimes by 50,000 during his first year in office. In addition, Kelly launched the first major quality of life offensive against the notorious “squeegee men” who were plaguing city motorists at the time. In January 1994, following the change in mayoral administrations, Kelly retired from the NYPD. Ten months later, he was appointed by President Bill Clinton to serve as Director of the International Police Monitors in Haiti. In March 1995, upon his return to the U.S., he retired as a Colonel from the Marine Corps Reserves after thirty years of service. Kelly was then appointed Under Secretary for Enforcement at the U.S. Treasury Department, where he supervised the Department’s enforcement bureaus including the U.S. Customs Service, the U.S. Secret Service, the Bureau of Alcohol, Tobacco, and Firearms, and the Federal Law Enforcement Training Center. In 1998, Kelly was appointed Commissioner of the U.S. Customs Service, where he managed the agency’s 20,000 employees and $20 billion in annual revenue. In 2000, he joined Bear Stearns and Co., Inc. as Senior Managing Director of Global Corporate Security. He was in his office in midtown on September 11, 2001, when the World Trade Center was attacked. A longtime resident of Battery Park, Commissioner Kelly was motivated by the events of that day to return to public service. He received that opportunity when Mayor Michael R. Bloomberg swore him in as New York City Police Commissioner in January 2002. It was clear from the start that his second tenure would be very different. The NYPD found itself on the frontlines of the global fight against terrorism. In response, Commissioner Kelly created the first counterterrorism bureau of any municipal police department in the country. He also established a new global intelligence program and stationed New York City detectives in eleven foreign cities. Despite having 6000 fewer officers and dedicating extensive resources to preventing another terrorist attack, the NYPD has driven crime down by 34% from 2001 levels. Commissioner Kelly has been supported at every stage of his extraordinary career by his devoted wife, Veronica, who he met on Long Island one summer when he was a young lifeguard. Together they raised two sons, James and Greg. Ten years after returning to the role of commissioner, Kelly is still doing what he set out to do back in 1963: serving and protecting New York. Dr. John L. Lahey, university president and preserver of our history, is inducted into the Irish America Hall of Fame. President of Quinnipiac University in Hamden, Connecticut for over 25 years, Dr. John L. Lahey is as dedicated to leadership and education as he is to his Irish ancestry. The burgeoning Quinnipiac campus, its unprecedented Ireland’s Great Hunger Museum, and Dr. Lahey’s work with the New York City St. Patrick’s Day Parade Committee are all testaments to his exceptional commitment and vision. Born and raised in the Riverdale section of the Bronx, Dr. Lahey has roots in Co. Clare on his mother’s side of the family, and in counties Cork and Kerry on his father’s. His paternal grandfather, a stonemason, emigrated from Knockglossmore, Co. Kerry to Canada, eventually settling in New York. Growing up in the very Irish enclave of St. Margaret’s parish, Lahey has often recalled that “it seemed like everyone was Irish.” Even as a boy he was very involved in the Irish community, marching behind Fordham University’s banner in the St. Patrick’s parade, as a student of Fordham Preparatory School. At the University of Dayton in Ohio, he discovered a deep interest in philosophy, earned his bachelor’s and master’s degrees in the field, and met his future wife, Judy, with whom he has two sons. Following his time at Dayton, he went on to complete a PhD in philosophy at the University of Miami. In 1977, after teaching at St. Bernard’s College in Alabama, he returned to New York and earned a second master’s degree, this time in academic administration, at Columbia University. Upon graduating, he was hired by Marist University in Poughkeepsie, NY, where he quickly climbed the administrative ladder, becoming chief operating officer and executive vice president. After ten years at Marist, at only 40 years of age, he became president of Quinnipiac. The transformation Lahey has ushered in during his 25 years at Quinnipiac is nothing short of remarkable, and is a result of his skill as a leader and innovator. 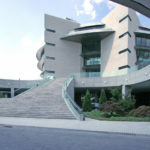 During his tenure there, the university’s academic programs, facilities, enrollment, national ranking and prestige have grown at an unprecedented rate. When he started at Quinnipiac in 1987, it was still Quinnipiac College – a small, quiet commuter school with one campus, an endowment of $5 million and an application pool of 1,000. Today it has a bustling student population of over 8,000, with close to 6,000 undergrads, 2,000 graduate students, and 500 enrolled in the law school, which was established under Lahey’s lead. The university now runs three campuses, has an endowment of $277 million, and applications for the incoming class exceed 19,000. Lahey has also had a hand in the athletic teams’ entrance into the NCAA Division I Northeast Conference; the establishment of the highly regarded Quinnipiac Polling Institute; and the Frank H. Netter, MD, School of Medicine, which will open in 2013. 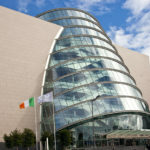 The accomplishment closest to his heart and his Irish roots, however, is the creation of Quinnipiac’s Ireland’s Great Hunger Museum, which seeks not only to commemorate the people who either died or fled Ireland during the famine, but also to educate the public about An Gorta Mór, to present a comprehensive history of the tragedy and its aftermath. The focal point of the museum is the extraordinary Lender Family Special Collection. Founded in 2000 following a donation from Marvin and Murray Lender, the collection contains 700 volumes, historic and contemporary texts, and an ever-growing number of works of art that portray or respond to the loss of more than 1.5 million Irish lives between 1845 and 1852. These include pieces by contemporary artists Padraic Reaney, John Behan, Rowan Gillespie, Glenna Goodacre, Niall Bruton and Kieran Tuohy, and period pieces by such artists as James Brenan and Jack B. Yeats. Of his passion for the NYC St. Patrick’s Day parade, Lahey told Irish America “It allows us to remember, celebrate and pass on to the next generation what it means to be Irish, and what our struggles and accomplishments have been over the past 250 years in this country.” In his own work and life, John Lahey does the very same. Tom Moran, businessman and humanitarian, is inducted into the Irish America Hall of Fame. Chairman, president and CEO of Mutual of America, Tom Moran was born in 1952 on Staten Island, NY, one of three children of an Irish-Italian-American mother and an Irish-American father, with roots in Counties Fermanagh and Tipperary. Moran’s maternal grandfather, Arturo Quaranta, was from outside of Salerno, Italy, and as Moran pointed out in a previous interview with Irish America, he “was a lover of all things Irish, especially Peggy O’Neill,” his wife and Tom’s grandmother. Always a modest man, Moran is quick to give credit to others, beginning with the Sisters who educated him as a young boy. When he first started grammar school, he wasn’t able to speak. However, the nuns of the Daughters of Divine Charity worked with him, and by the time he was in the second grade he was talking. At the age of 14, Moran began his first job as a janitor at his high school. He followed this by working as the french fries man at Nathan’s Hot Dogs, a short-order cook, and a cemetery worker. While attending Manhattan College, he drove a cab during the night shift. Through these diverse work experiences, Moran learned valuable lessons and developed the beliefs that continue to influence his life and work today. After earning his B.S. degree in mathematics, Moran began working at Mutual of America in 1975. Back then, his job was to “paperclip anything that needed to be signed” whenever a pension had been sold. When there were a pile of contracts to be signed, he would bring them to then-president (and 2011 Hall of Fame inductee) Bill Flynn. It was from Flynn that he learned another important lesson, about making sure that the people who work for a company, no matter how big or small the role they play, know and feel that they are important. On a personal note, it was at Mutual that he met his wife, Joan, in 1976. 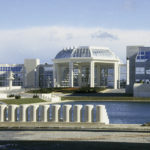 The couple married in 1983 and both still work for the company – Moran as president, CEO and chairman, and Joan responsible for the company’s technology. They share a love of family and friends and a passion for philanthropy and volunteerism. Mutual’s influence on Moran is apparent when one looks at the causes he is personally involved with: Abilities, Concern and the Northern Ireland peace process. Tellingly, he never discusses his philanthropic work in terms of what he has done, but rather by discussing what the organizations do. In 1992 Moran became involved with the Abilities Foundation, which works to improve the lives of people with disabilities, and through them he is also involved with the Henry Viscardi School for students with severe physical and medical disabilities. Moran was drawn to these programs due to their shared belief that people with physical disabilities can and should pursue their dreams. Moran is the chairman of Concern Worldwide (US), an organization founded in 1968 in response to the famine in Biafra. Today, Concern has programs in 28 of the world’s poorest countries, and implements emergency responses to disasters, in addition to targeting poverty and hunger. Moran first became involved as a donor for the organization. His passion for Concern’s mission quickly grew, and he joined the board, eventually becoming the chairman. In this role, he takes an active approach, which has given him the opportunity to travel to Haiti, Rwanda and the Sudan. These intense and important trips have left him even more impressed with and dedicated to Concern’s work. It was through Flynn that Moran’s involvement with the Northern Ireland peace process began. He had first visited Ireland in 1970 and enjoyed his time there, but he credits Flynn and Bill Barry with generating his passion for the country and its future. In his involvement with the peace process, Moran has worked behind the scenes, resulting in strong friendships with those on both sides of the conflict. When he was honored as Irish America’s Irish American of the Year in 2008, accolades were bestowed on him from Ian Paisley, Gerry Adams, former Taoiseach Bertie Ahern, and Sir Hugh Orde, then-chief Constable of the PSNI, among many others. In addition to these praises, Moran has been awarded numerous honors, including the Ellis Island Medal of Honor, which celebrates “remarkable Americans who exemplify outstanding qualities in both their personal and professional lives, while continuing to preserve the richness of their particular heritage.” It is a fitting description of Tom Moran. The latest Irish and Irish-American news in film and television. 1. From Southie to the Five Points to Downton Abbey, the Irish are taking over American television! First, the cast for an upcoming series about Irish cops in the Five Points is starting to come together. Dublin-born actor Kevin Ryan has signed on to Copper, the BBC America series set in the grimy wards of 1860s New York, when the streets teemed with Famine immigrants and those very immigrants joined the ranks of the NYPD. Ryan is relatively unknown in the U.S., having appeared on TV in Entourage and Days of Our Lives, as well as in the film The Fast and the Furious: Tokyo Drift. Ryan will play detective Francis McGuire alongside Tom Weston-Jones, who plays Kevin Corcoran. German actress Franke Potente (The Bourne Supremacy) will also star in Copper, which was developed by acclaimed director Barry Levinson (Rain Man, Wag the Dog, the Irish film An Everlasting Piece) as well as Oz’s Tom Fontana and Southland’s Will Rokos. Copper may be Kevin Ryan’s breakout role. Ryan comes from a long line of Irish stonecutters, and even began heading into the family business before taking a shine to the bright lights of show biz. Ryan has numerous upcoming films, including the lead in the thriller Tripping Tommy, and a role in the Irish film Songs for Amy, alongside Patrick Bergin. 2. Speaking of Irish actors who gained wide exposure by appearing in critically-acclaimed cable dramas, let’s catch up with Dubliner Aidan Gillen, best known for playing politician Tommy Carcetti on the gritty HBO series The Wire. Gillen will be appearing in the blockbuster-to-be Dark Knight Rises this summer. Gillen plays a CIA agent in the film, which stars Christian Bale as the famous crime fighter. Gillen, who has also appeared in the HBO drama Game of Thrones, will also be seen in two upcoming films with sharp Irish angles. First there’s Shadow Dancer, which also stars Clive Owen and Gillian Anderson. Shadow Dancer is about an IRA member who begins informing on the group for British intelligence. Then there’s Calvary, also slated to star Brendan Gleeson and Chris O’Dowd (the Irish cop from Bridesmaids – more on him later). Calvary is about a priest who hears something dangerous in the confessional and fears for his life. It was written by John Michael McDonagh, who wrote the acclaimed dark comedy The Guard (also starring Brendan Gleeson), as well as 2003’s Ned Kelly, featuring the late Heath Ledger. 3. It may be a very British series but the PBS hit Downton Abbey has strong Irish ties. Michelle Dockery (Lady Mary Crawley), Siobhan Finneran (who plays maid Mrs. O’Brien) and Brendan Coyle are among the cast members. Dockery is the daughter of an Irishman from Athlone. Initially a stage actress, she made her television debut in 2005 in the BBC mini-series Fingersmith. Her breakout role as Lady Mary has clearly led to good things, as Dockery recently landed a part in Joe Wright’s Anna Karenina, which will also feature Domhnall Gleeson. Finneran’s father hails from Co. Leitrim. She has made a name for herself mainly in British television and film. Coyle, meanwhile, was born to an Irish father and Scottish mother, both of whom lived for some time in Strabane, Co. Tyrone. Coyle plays John Bates on Abbey, and will also be seen in April’s The Raven, alongside John Cusack. Downton Abbey has proven an unlikely hit with American audiences, and also stars Maggie Smith and Irish-American Elizabeth McGovern. It ended its second season in late February, but has proven a smash hit through Netflix and other online services, as word of mouth has gotten stronger and stronger. 4. Also, on the TV front is a show with not quite so much cultural potential. For better or worse, we have all seen some of those reality shows about insane women who are placed into rooms with other insane women and eventually start pulling each others’ hair. Well, a plan is in the works to bring such a concept to South Boston, that famous Irish American redoubt. It all may have started as a simple YouTube spoof – something called The Real Housewives of South Boston had been making the rounds on cyberspace. But earlier this year, the TLC network announced plans for Southie Pride, a reality show focusing on local women and their families. And – wait for it – the production team behind MTV’s Jersey Shore has been hired to oversee at least eight episodes of Southie Pride. For the record: in case a hometown hero like, say, Mark Wahlberg comes out swinging against this exploitation of Southie, I have a feeling that Mickey Ward’s loud brood of sisters in The Fighter just might have had something to do with this concept. 5. Back to Martin McDonagh… The acclaimed writer and playwright will team up with fellow Irishman Colin Farrell for the upcoming film Seven Psychopaths. Also starring Woody Harrelson, Christopher Walken and Abbie Cornish, Seven Psychopaths is about a writer who gets involved in a plot to kidnap a dog. Expect the Farrell-McDonagh collaboration to hit the festival circuit in late 2012. This is a reunion for Farrell and McDonagh, who made the highly-underrated In Bruges together. See Irish America’s on-set interview with McDonagh and Farrell. 6. As for Chris O’Dowd, look for him in the April comedy Friends with Kids alongside fellow Irishman Ed Burns, Mad Men’s Jon Hamm, his partner Jennifer Westfeldt and funny girls Maya Rudolph and Kristen Wiig. O’Dowd does another comedic turn in the Judd Apatow film This is Forty, which is slated for a December 2012 release and appears to catch up with several characters from Apatow’s hilarious 2007 pregnancy comedy Knocked Up. Further down the road, O’Dowd has signed on for the 2013 film Sean Carlin Goes Crazy. 7. Two generations of Irish talent will be get together for the vampire flick Byzantium. Director Neil Jordan and Oscar nominee Saoirse Ronan will team up for the film, set to be shot in Dublin and Wicklow. Though not yet 20 in real life, Ronan will play a 200-year-old vampire with killer piano skills, which required her to actually learn to play the instrument. 8. The Ian Palmer documentary Knuckle – about Irish gypsy bare-knuckle boxers – is being transferred to the American South for a new HBO series to be written by Trainspotting author Irvine Welsh. “Think Fight Club meets the Hatfields and the McCoys,” Welsh recently said of the series which will feature warring Irish-American clans. 9. And finally, everybody’s favorite Irish TV angel Roma Downey recently announced she will be producing a series for DVD release entitled – fittingly – Little Angels. The series is aimed at preschoolers and combines lessons in ABCs and 123s with Bible stories. “When I was a child, there was a charming nighttime prayer we would say that became the inspiration for the series,” Downey recently told Parade magazine. “I thought it would be marvelous to have something reminding children that they’re always being looked after.” See Irish America’s interview with Downey. Legendary Irish actress Fionnula Flanagan was presented with a Lifetime Achievement Award at the Irish Film and Television Awards (IFTAs) in Dublin, on February 11. The award, presented by Irish President Michael D. Higgins, was given in recognition of her accomplished and varied career as an actor, which spans over 50 years and continues to thrive. Trained at Dublin’s Abbey Theater, Flanagan first gained international note for her stage work, particularly her interpretation of Joyce’s Molly Bloom, which she honed to a fine art when she wrote and starred in James Joyce’s Women. She went on to the world of film, starring in such gems as Some Mother’s Son, The Others, and Waking Ned Devine. In television, her résumé has included a diverse range of productions, including Star Trek, Lost and Brotherhood. President Higgins called Flanagan “a true master of her craft.” Flanagan said that it had been “a long, long journey, but a great one,” and reminisced about her childhood in Dublin. The icing on the cake: Flanagan won a second award, snagging the IFTA for best supporting actress, for her role as Brendan Gleeson’s ailing mother in the 2011 hit The Guard. This speech was made just a decade after the initial influx of what amounted to over a million impoverished Irish immigrants to America. After this mass exodus from Ireland, through the initial hardships and a long journey to acceptance, a cohesive Irish-American identity began to form and developed an increasingly powerful influence on American culture. Below are some of the most long-standing, interesting and surprising ways St. Patrick’s Day, which was originally just a feast day in Ireland, is celebrated in America. • The first-ever St. Patrick’s Day Parade took place not in Ireland, but in the U.S. – in Boston in 1737, organized by a group called the Charitable Irish Society. • On St. Patrick’s Day, 1762, Irish soldiers serving in the British Army marched in New York City. In the 1850’s and 1860’s the parade drew an ever-growing audience as Irish-Americans laid claim to a new cultural identity. The New York parade is now the largest in the world. • The St. Patrick’s Day Parade in Montreal has run consecutively since 1824. While the parade in Quebec, which was first held in 1837, was cancelled during WWI and only resumed in 2010. • Savannah, Georgia’s parade is second in size only to NYC’s. Events, including the greening of the fountain in Forsyth Park, Tara Feis, and the Celtic Cross Mass and Ceremony, begin two weeks before the 17th. • For students at Ithaca’s Cornell University, St. Patrick’s Day is better known as “Dragon Day.” Every year, first-year architecture students design a dragon several stories high, which is paraded around campus and then ceremoniously set on fire. This tradition can be traced back to the early 1900s, when student Willard Dickerman Straight chose March 17 as the day on which the College of Architecture would celebrate itself. It began with adorning the main architecture building with ostentatious Irish decorations, but grew to involve a large cut-out of the saint being carried around campus, pursued by a 20 ft model serpent. By the 1950s, St. Patrick was out of the equation and the snakes had evolved into dragons. • Blue was the color originally associated with St. Patrick, though as the patron saint is believed to have used a shamrock to explain the Holy Trinity, it became a popular symbol of the day, and that symbolism eventually spread to the color green in general. In addition to the now traditional (if not exactly authentic) green bagels, carnations and beer, some of the more surprising U.S. recipients of green dye include the White House Fountain and the Chicago River. The Chicago tradition began when Stephen M. Bailey, business manager of the Chicago Journeymen Plumbers Local Union 110, got the brainwave to experiment with a dye used to detect leaks in the city’s drainage system. On St. Patrick’s Day 1962, 100 lbs. of the dye were pumped into the river, which remained in its festive state for a week. Eventually, 25 lbs. was settled upon as the appropriate amount. • Hawaii does not have a very large Irish population – not even when compared to its Pacific Rim neighbors – but its enthusiasm for the 17th is well known. According to local Murphy’s Bar & Grill owner Don Murphy, the Guinness Book of Records has dubbed Honolulu’s Historic Chinatown Block Party, “the single biggest St. Patrick’s Day party any one bar throws in the U.S.” Other Hawaiian Patrick’s Day events are the Corned Beef Musubi Eating Contest and The Emerald Ball at the Japanese Cultural Center, which raises money for the Society of the Friends of St. Patrick. Archbishop Hughes was correct: Irish cheer is infectious. The Irish diaspora turned March 17 into a day of Irish pride and revelry, reviving various folk traditions and creating a new mythology of celebration; one that could be enjoyed by all. This, far and above the beer and the funny hats, is surely the reason why such an ostensibly culture-specific day has taken hold of the most diverse nation in the world. In 1965, looking for an image to illustrate the poetry of William Butler Yeats, Dublin-born photographer Alen MacWeeney stumbled into what he calls “a deep pool of hidden Irish culture” – the world of the people known as Travellers – and found himself “lost in their lives and stories” for almost six years. MacWeeney speculates that American interest in Traveller culture comes partly from jealousy of “a romantic perception of freedom,” but really is fueled by a fascination with the unknown. The audience that night – like Brooklynite Alexandra Holt who wondered about Travellers in Irish history, or Terry O’Leary of Manhattan who yearned to hear even more “about such a mysterious population” – reflected that strong attraction. Moloney and MacWeeney are hoping to repeat their collaboration and expand this program to include his feature-length BBC/RTE documentary from 2000, along with more stories and music. The photographs, including stories and downloadable music, appear in Irish Travellers, Tinkers No More, a paperback reprint of the 2007 hardcover edition. For more information, see www.alenmacweeney.com and www.fallenangeltheatre.org.